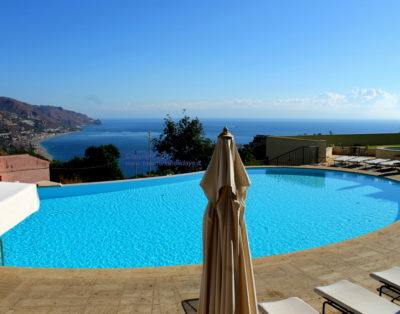 The apartment boasts a spacious covered terrace (Patio), with a breathtaking sea-view, and has direct access to the pool. Garage with reserved parking and elevator that will take you directly to the appartment or to the center of Taormina. The appartment is about 90 m². Two bedrooms for 4 people, a “pouffe ” bed in the living room for the 5th person. Two bathrooms: one with shower and the other one with bath-shower. Air conditioning in the summer and heating in the winter so that you can stay in this wonderful apartment all year round! WI-FI internet connection, TV and satellite system. Equipped kitchen with dishwasher. Fine furniture. There are also table chairs and bench in the terrace. The apartment has laundry area with washing machine. 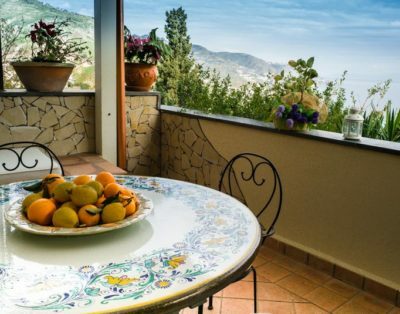 The Taormina Chic Apartment is situated next to Taormina Lux Apartment.